Thanks for a wonderful job at High Street. 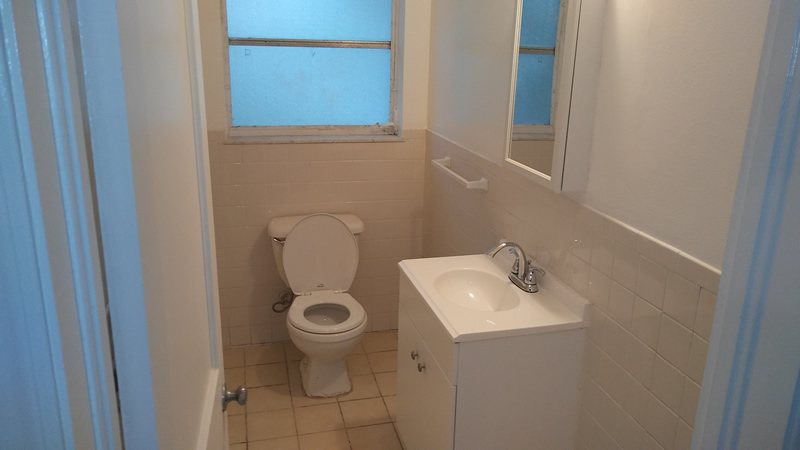 It sold in 2 days, and has now closed. 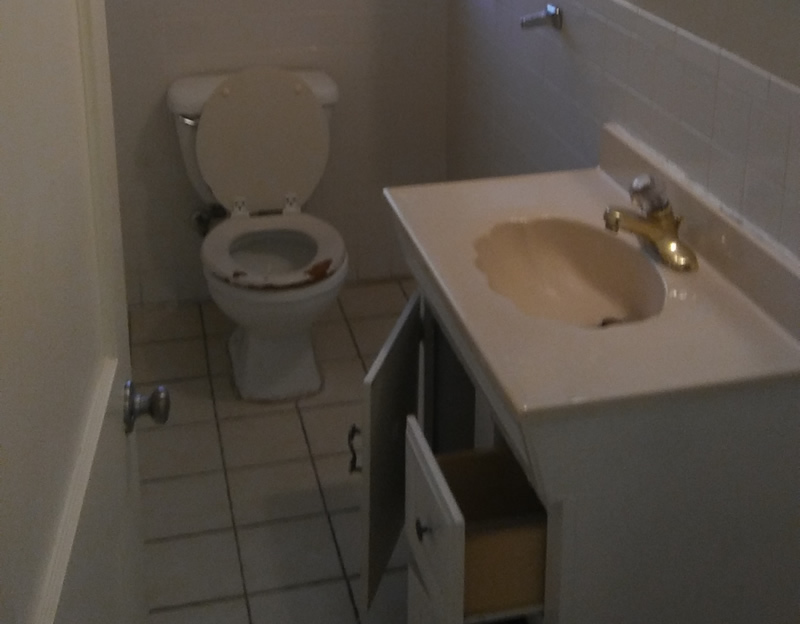 This was more of a renovations job located in West Palm Beach. Mary was referred to us from her realtor whom had seen our work at another job we did in West Palm Beach. 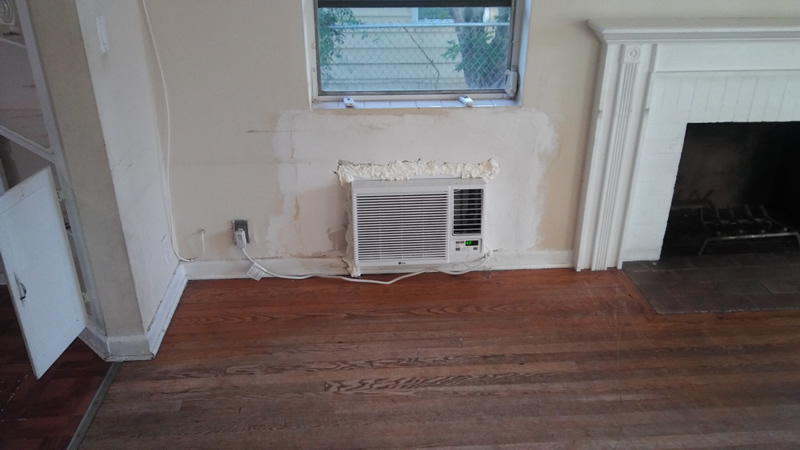 The house was empty but the walls looked horrible, the kitchen floor was horrible, the bathroom vanity was destroyed and the window AC units where barely hanging on for dear life. Not to mention we found that the bathroom had a huge toilet leak. So we brought in a plumber to repair the leak. 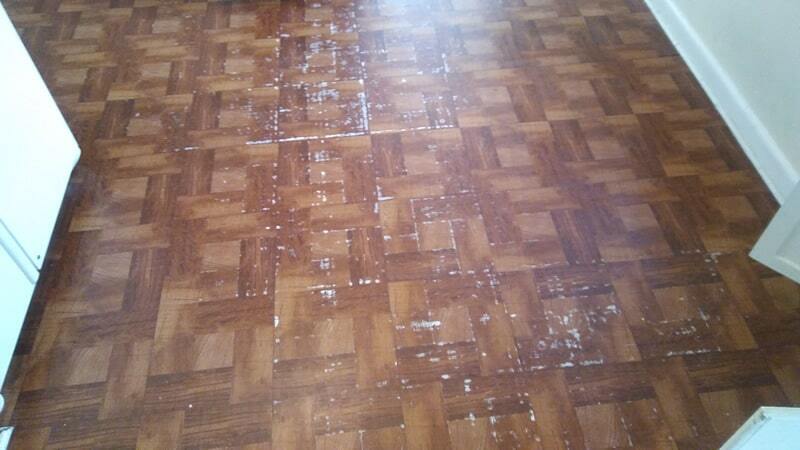 Then we did a light sand of the floors to make them look a little better. 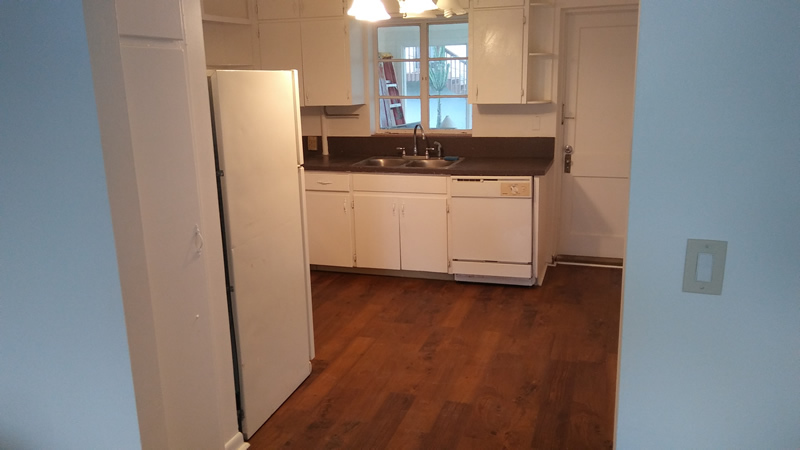 We did not replace the floors because the cost to do so would not yield a good return on investment for the owners. Next up we painted the entire inside of the house with 2 coats of good quality paint. There were quite a bit of stains that needed to be covered. 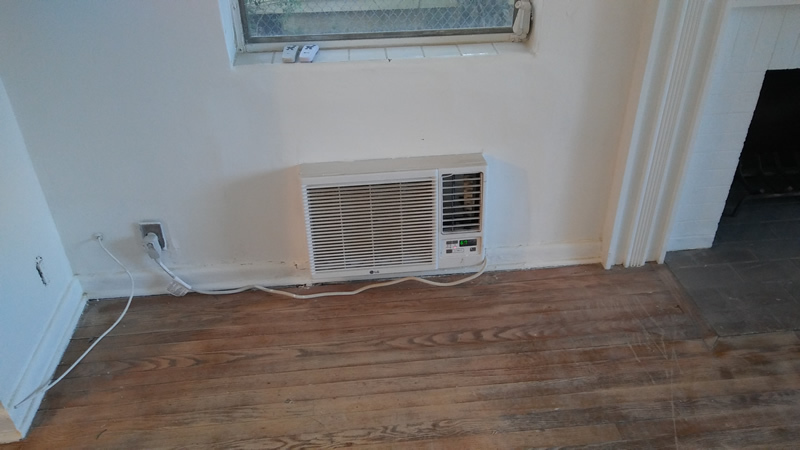 We then built custom frame structures to properly hold the windo AC units in the window. 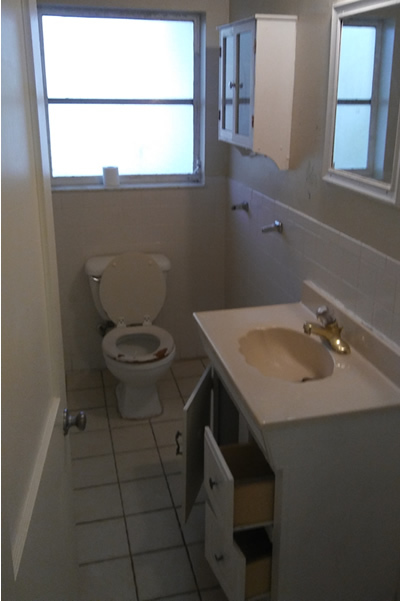 We replaced the Vanity and the Medicine cabinet. Without being requested we replaced the bath towel racks. The ECS Team also ripped up the laminate flooring that was in the kitchen. There where actually 3 layers of laminate on top of each other that was causing the long closet to scrap across the floor. We then prepared the base flooring and put down new laminate for a professional look and feel. Estate Cleanup Services is the premier Property Renovation Services to assist you in getting your property ready to be sold. You might have several projects at home that resulted in lots of unneeded materials. You might even take down some parts of your wall and you want to dispose of your waste. If this is the case with you then here are some tips that you can do to get rid of the waste products inside your home. If you have a lot of unneeded materials such as cement, paint, or wood, you might want to consider donating it to a charity or a non-profit organization. If you are cleaning your house and has extra appliances, you can go ahead and transfer the items into a resale organization. You might even be of help in your community and let some of the poor families get a new appliance in the process. You can go to local shops and resale houses if you have loose floorboards that you consider donating. There are a lot of wood dealers that are willing to accept what you can offer them. You can always use glasses for aquariums. If you have metals and wood left from the renovation, you can use them as new decorations inside your house. If you were not able to repurpose them and they just make your area crowded, you can sell them on scrap shops. This can include old appliances and other materials that you don’t need in your home. If you have old carpets, you might want to know that they are not biodegradable. That means that it will just take a thousand years before even they begin to change their forms. You can get the carpets to shops such as waste dump near me in order to recycle them. If your materials are unsavable and they can’t be generated into a new project, it is better to throw them away as your last option. You might want to see the results of your home renovation without the need to throw in useless materials inside the home. If you have generated a lot of waste, you can contact a service near you to pick them up. Some of them may even know how to recycle the waste and you can get them off your hands in no time. If you are going to do a home improvement, make sure that you are also helping your environment by getting rid of the wastes in the right ways. You can know more when you contact some companies who can recycle the wastes for you. You can also get in touch with pickup truck drivers and see if you can get discounts for wastes inside your home.